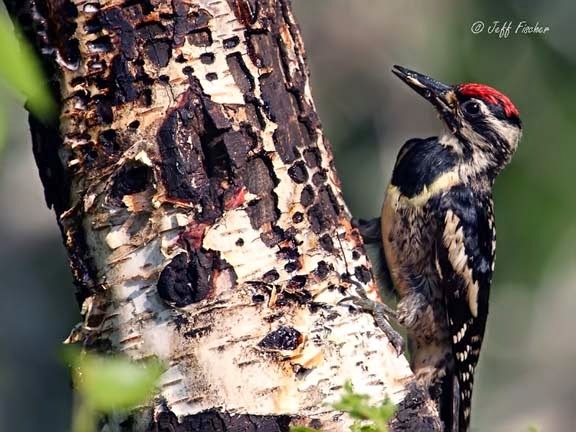 The yellow-bellied sapsucker is a small to medium woodpecker that nests in northeastern United States and Canada. Unlike most other species of woodpeckers most yellow-bellied sapsuckers migrate south each winter into the southeastern United States, Mexico, Central America, and the Caribbean. On their breeding grounds they prefer a habitat with new growth and younger trees but during the winter they are not as picky. 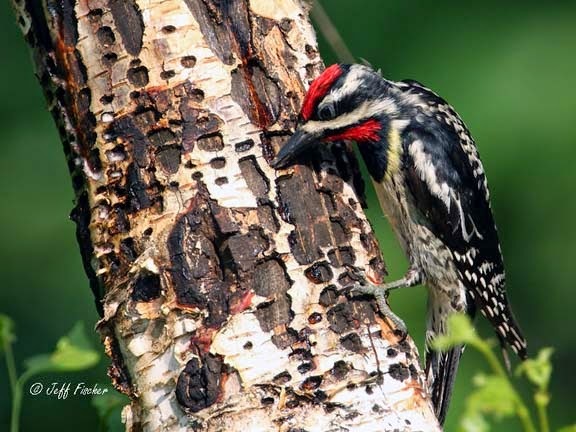 As their name implies the yellow-belied sapsucker's primary food source is tree sap. In the spring they drill holes deep into the tree to get to the sap that is traveling up to the tree branches. Later, after the trees leaf out, they drill shallow holes into the tree to get to the sap that is carried down from the leaves. They usually choose a sick or wounded tree from a species with a high sugar content, up to about 10% sugar. They must continually maintain the holes to keep the sap running, using their log tongues to lick it up. Besides eating sap yellow-bellied sapsuckers also eat the cambium, or core of the tree, fruit and insects which they glean from the trees. Good commentary and pics of this Yellow-bellied Sapsucker.His unique diet doesn't seem to make him overweight! :)Over in Portugal we don't see this species. hi. 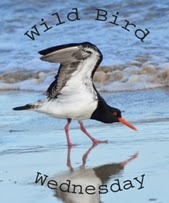 Lovely looking bird and interesting information about it. ...I love this bird Steve. Nothing like the bird I envisaged in my early teens when I used to hear Art Carney talk about this bird in The Honeymooners series. Maybe well before your time! It stuck with me all these years. In fact it did because I thought it was such a funny name and that it was a fantasy name at that! Well I keep on learning new things. I guess I didn't realize that a woodpecker could eat something besides bugs. The sap of the tree is new to me and boy that tree looks pretty worked over. Great shots of the woodpecker. Great photos and great info!